When pricing a building, we will need the width, length and height that you desire. For example a 20 x 30 x 7 Building would be 20' wide x 30' long and 7' high at the eaves. 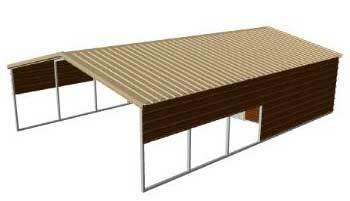 We will also ask you if you would like a vertical or horizontal roof. Horizontal Roof: Water runs off the ends. Horizontal roof sheeting will run from the front to the back and is the most economical type of building. 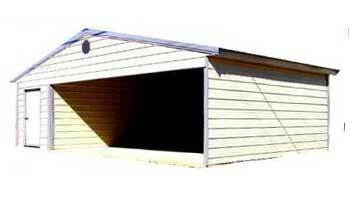 We may also ask if you are wanting a carport, a full building, a combination (combo), gambrel barn or high pitch. Carports are covers only, you can choose a horizontal or vertical roof, whether or not to have a gable and the number of sheets to put on the side. Full buildings are fully enclosed, you can choose a horizontal or vertical roof. The full building is pictured to the right. 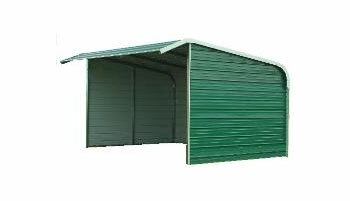 Combos are a combination of a carport and fully enclosed storage unit. You can choose between a rear combo and a side combo. Rear Combo has storage in the rear. Side Combo has storage on the side. With each of these options, you can also choose to have a gable and enclose the sides if you wish. 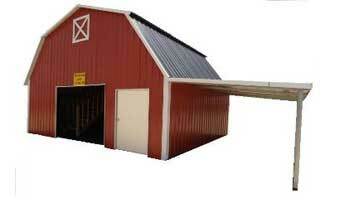 Gambrel Barns have a gambrel style roof and can have vertical or horizontal roofing. Horse Barns come in many styles including standard, raised center aisle (RCA), full loafing sheds and half loafing sheds. 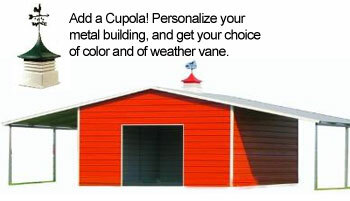 Also, click here to take a peek at our current metal building specials! Carports are covers only (no side panels). You can choose a horizontal or vertical roof, and whether or not to have a gable and the number of side panels to put on the sides or ends of your carport. The carport style is pictured below. 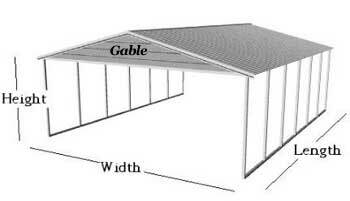 Shown: 20' x 30' x 9' carport with a vertical roof and a gable on one end. The combo style is pictured below. Shown: 30' x 27' x 7' side combo with a vertical roof, gable end, enclosed sides, and enclosed end (rear). There is one personnel door in the storage area. Shown: 20' x 30' x 7' rear combo building with a vertical roof. There is one extra side panel on each side, which helps block direct sunlight. 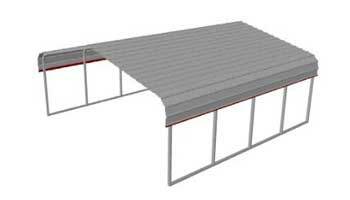 Shown: 20' x 20' x 8' metal building with a vertical roof. Building has two 9' x 7' roll-up doors and one 4' pedestrian door on the side. 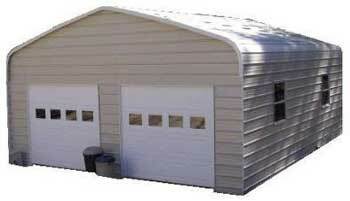 Shown: 24' x 30' x 10' full metal building with a horizontal roof. Building has two 9' x 7' garage track doors on the end, and two windows on the side. Shown: 20' x 20' x 8' gambrel barn with a vertical roof and vertical sides. This building has one 9' x 9' opening on the end, one 4' pedestrian door, and one 10' x 20' x 7' lean-to on the right side. 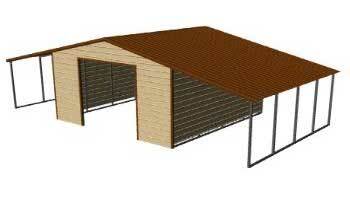 Shown: 40' x 20' x 8' standard horse barn with a vertical roof and horizontal sides. The 8' eave height is the outside eave height. Barn consists of a 20' x 20' enclosed structure (with 10' x 10' opening), and two 10' x 20' lean-tos. 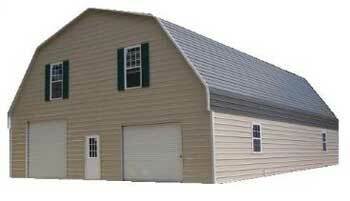 Shown: 40' x 20' x 8' standard horse barn with a horizontal roof and sides. The 8' eave height is the outside measurement. Barn consists of a 20' x 20' enclosed structure (with 10' x 10' opening), and two 10' x 20' lean-tos. 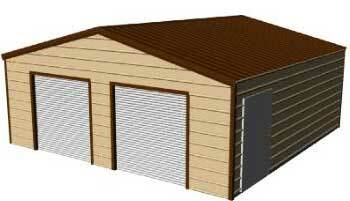 Shown: 10' x 15' x 7' half loafing shed with horizontal roof and sides. 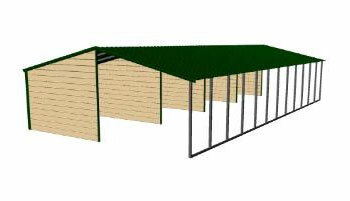 Shown: 24' x 48' x 8' full loafing shed with vertical roof, horizontal sides, and a stall every 12'.